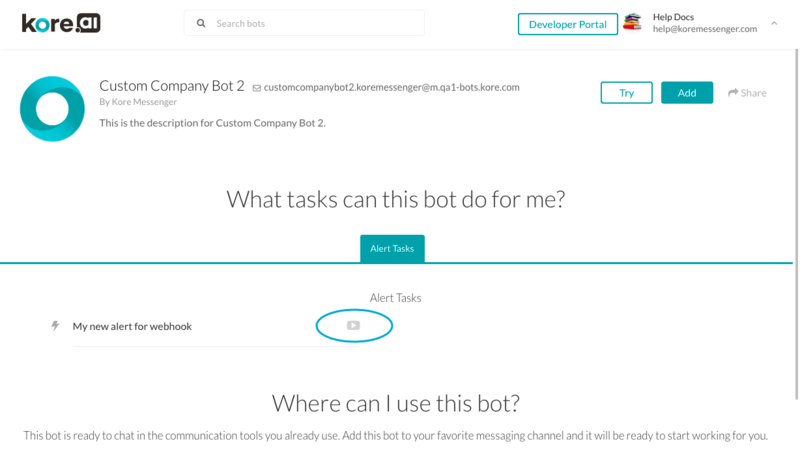 As the first step in building an Action task, you need to navigate to the Action Tasks tab in your bot and start creating one by entering the general details. The General tab for Action tasks includes details such as task name, connection mode, descriptions, and a few advanced settings such as its mapping to any other alert tasks. Open the bot in which you want to create the Action Task. Enter a name for the task, which also doubles up as the display name. You can change the display name based on how you want the task to be named in the Kore.ai Bot Store. Select a connection mode for the task, Rest or SOAP, and then click Create & Proceed. The General Tab of the Action Task opens. Refer to the following table for the field descriptions. Display Name The name of the task as it gets displayed in the Kore.ai Bot Marketplace. It is same as the task name unless you want to change it. Task Name The name of the task as displayed everywhere in the application and end-user channels. Connection Type The connection type for Action Tasks is always web service. The web service sends data to Kore.ai when it polls using the end user credentials. This setting is read-only for action tasks. This is the communications protocol connection type for your task as a web service. The web service sends data to Kore.ai when polled by Kore.ai using the end-user account log on credentials. REST – The task uses a REST API connection that is protocol-independent to exchange messages and to handle CRUD operations for web services. SOAP – The task uses a SOAP API connection based on XML protocols for message exchange. You may want to configure optional advanced settings for your task. To expand the Advanced Settings section on the General tab, click the Expand icon . The following table describes the Advanced Settings fields. Specify one or more search words an end-user can use to help locate this task in the Kore.ai Bot Store. Task Demo Link Enter a www.youtube.com link to display a demo icon next to the task name in the Bot Store. The following illustration shows a bot task defined with a Task Demo Link. (Applies only to SOAP requests) Select Yes to use authentication if web service authorization is required to access the WSDL for SOAP requests. When Yes is selected, the Authentication defined for the API request is used to access the WSDL. This setting is only available when the task Connection Mode is set to SOAP. Get Optional Fields Select Yes to require the end-user to select and then enter at least one of the available optional parameters. After you define your action task and then click Save, you may need to set up authorization to access the Bot if authorization is required. For more information, see API Request Tab – Authentication Settings for an Action Task. Following the authorization settings, you need to define one or more request objects to get any data required for the task from the Bot. For more information, see API Request Tab – Action Task – REST or API Request Tab – Action Task – SOAP.